While former Woolworths up and down the country now play host to Poundland and B&M Bargains – with just the occasional Waitrose – the Surrey town of Farnham has arguably the poshest ex-Woolies of the lot. Though I’ve now visited and photographed nearly 300 former Woolworths sites across the UK – about 1 in 5 of the historic total – Horley’s long-closed branch (#545) is the only one I’ve been to in Surrey. 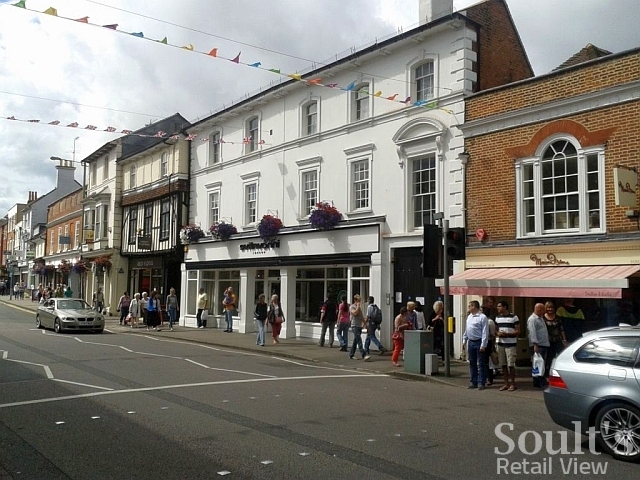 I’m sure that will be rectified in due course, but in the meantime I was glad to hear from regular Soult’s Retail View contributor Steve Hack about his visit to what’s replaced Woolies in Farnham (#372, opened on 5 October 1929) – the town where he grew up. 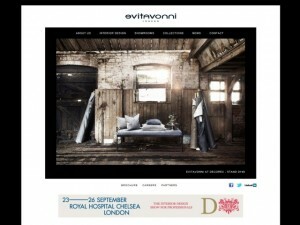 Since 25 November last year, the site has been occupied by Evitavonni, an interior design showroom that “encompasses a blend of interior design service alongside a retail environment including room sets, fabric collections, interior furniture, accessories and bed and bath products”. 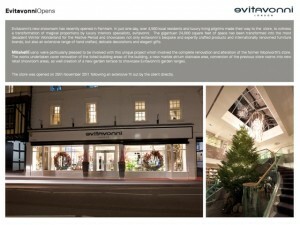 As Steve discovered, the transformation by Surrey-based architects Mitchell Evans LLP and Evitavonni’s own designers seems truly remarkable, giving the property “a multi-million pound makeover” to create what the architects describe (in all seriousness, I think) as “a veritable haven of contemporary retail opulence”. Such hyperbole may be a bit OTT, but there’s no doubt that the historic property is now one of the most elegant and well-presented ex-Woolworths you’re likely to come across. It’s a huge contrast, too, with the move-in-as-it-is approach to ex-Woolies sites employed by B&M and others, and an incredible transformation, inside and out, from the tired-looking, blue-painted property that was left in Farnham’s West Street after Woolworths’ demise. So, what did Steve make of Evitavonni’s “transformation of magical proportions”? “To say the building has been transformed is an understatement: where the pick ‘n’ mix used to be is now a high-class florist; the till area is now home to a room selling expensive candles; and where the music department used to be (where I spent a lot of money in my younger days as Woolies was cheaper for singles than the nearby Our Price) now contains a selection of expensive sinks and taps. “I was impressed with a tap that lights up with blue LEDs when you switch it on, but as it costs hundreds of pounds it’s not high on my list of purchases! The only thing that hasn’t changed on the ground floor is the retail space used; you can still see where the shopfloor opens out towards the back but the new owners have added extra windows along the side. The flooring used in parts of the store and on the stairs contains tiny blue LEDs to add extra sparkle. “Perhaps the biggest transformation is the opening up of the upper floors which previously contained stockrooms, offices and a flat. These are accessed via a double set of stairs which begin in what was the toy department and merge in the middle. The small rooms at the front of the first floor have been used as literal room sets, and there is also a crescent-shaped walk that takes you through shower and kitchen displays. “Unfortunately it was almost impossible to take photos inside the store: there were signs everywhere warning against photography and security guards are highly visible at the entrance. 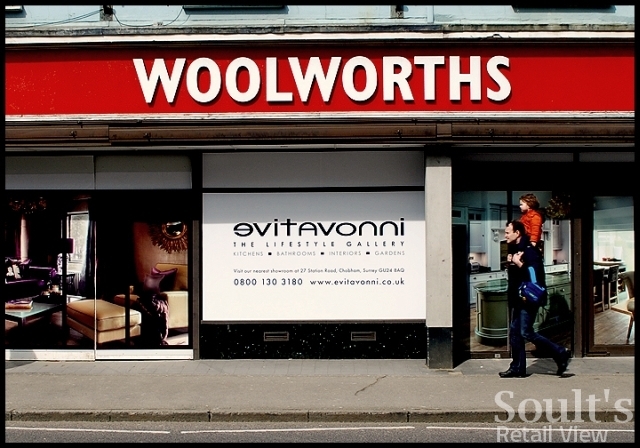 “Evitavonni is exactly the sort of store that works well in Farnham: the town has a fairly upmarket customer base and the prices reflect this. I saw a hand towel priced at £50 and my partner spotted a £15 salt cellar. Impressive as it looks, though, I feel it is the wrong sort of shop for what is a prime location on the main shopping street. “Farnham lacks a decent variety retailer and a decent selection of well known names to complement the strong independent offering. A relative of mine who used to be manager at another major store in the town says that the closure of Woolworths took a lot of trade away from the town. It certainly feels quieter without Woolies around. 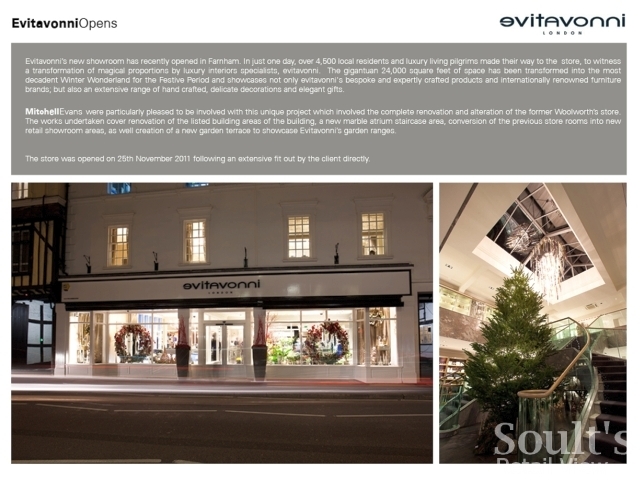 From Steve’s account and exterior photograph, and from the various photographs and descriptions on the web, Evitavonni sounds like a truly impressive piece of retail interior design, and is certainly somewhere I need to visit. The store’s apparent aversion to photography got me thinking, though. In most shops, it’s reasonable to assume that taking photographs without permission might be frowned upon, though there probably wouldn’t be any signs expressly telling you so. In Evitavonni’s case, however, the presence of specific ‘no photography’ signs implies that the business knows it’s created something stunning and that people would want to capture it. So, why the clampdown? I understand that there might be all kinds of security and privacy reasons cited (rightly or wrongly) for a ‘no photography’ policy, just as there often are in shopping centres (though Capital Shopping Centres, at least, moderated its policy last year after a “very public debate” following ‘Hazelgate’). CSC’s approach – which broadly allows photography as long as it doesn’t snoop in private areas or try to capture people without them knowing – seems a sensible reaction to inevitable change, as a generation grows up with smartphones, Twitter, Facebook, Instagram and an inherent desire to share. Perhaps instore photography needs to be seen not as something to be feared, but as a way in which great retailers can benefit from customers sharing and celebrating what they love about their stores, whether that’s a cool product or a brilliant display? Maybe a retailer somewhere has already done it, but I’d love to see a store really engaging its customers by having a photography competition, perhaps encouraging shoppers to photograph and share their favourite product instore, or to come up with the most unusual or creative view of the store interior. Such a move could be a really effective way of generating buzz, positive PR, and, ultimately, more footfall and sales. As I noted earlier today, social media means that connected customers can be a retailer’s most enthusiastic champions, potentially making the difference between an independent retailer that thrives and one that gets overlooked. As online and mobile sharing become ever more ubiquitous, I, for one, can’t wait to see more and more creative, enterprising retailers opening themselves up to the opportunities. 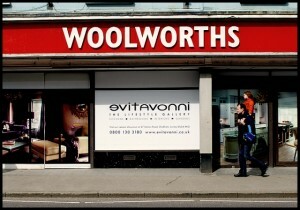 Thank you to James Delaney (jimdelaney on Flickr) for the photograph of Farnham’s closed-down Woolworths. My retail consultancy business, CannyInsights.com, provides bespoke place- and sector-specific market intelligence, covering the whole of the UK. It also works with independent retailers to improve their stores, their market knowledge, and their online marketing via Twitter, Facebook, blogs and websites. For more information, visit www.cannyinsights.com, drop me an email, or give me a call on (0191) 461 0361. 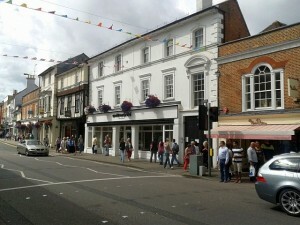 I went to Farnham recently and the store is very elegant and sparkly. Farnham is very posh and does have another independent department store, but even here you can see a few clothing boutiques have closed. If you want a treat then Maison Blanc, is a wonderful french patisserie. It’s a small posh chain whose store locations are an accurate marker for the green wellie and headscarf brigade.